Shouldn't I make my driver cancel so I am not charged the cancellation fees? I feel like the drivers always ask me to cancel when he doesn't want to take me. Why does this happen? 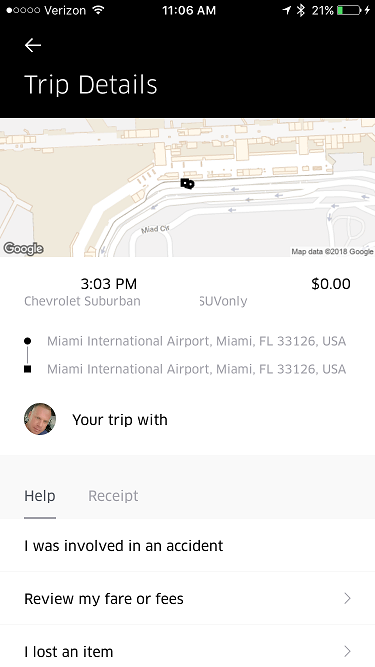 I was taking an Uber from Miami airport, and UberBlack responded. He was parked outside of the airport premises, and didn't move at all for a few minutes. Then he started to move...then he stopped. Then called me to tell me that he had car trouble and that I should cancel. I told him that he should cancel, and he insisted that it's easy and that I should. and that if there are any issues, I can call Uber. I refused, took my friend's Uber, and proceeded to drive off. He never showed up, and I believe he eventually cancelled. My friend told me to make sure I didn't get charged fees. What was he trying to pull? Did I do the right thing? Are there drivers who can tell me what happened here. OMGGGGG Uber is SO annoying. I left my phone in the car and had to go an hour and a half to get it. And then they charge me $15! I met him near his house! Is this a driver scam? Driver starts the trip WITHOUT YOU in the car. Why? Maybe to find your destination? Then cancels if he doesn't like it. I didn't receive my cancellation fee from the rider who cancelled. What could be the reason? Uber of course isn't writing back. Did the rules change? Here are my thoughts as a driver. You say the driver was an Uber Black. Did you order an Uber Black? If not, he probably wanted a Black drive which pays more. He did not want to cancel as he would lose his place in the queue. If the pax cancels then the rider maintains their place and gets the next ride. I attached my receipt below for more clues, but you are righ that it maybe the airport queue thing? How long do drivers wait in those? ...but that means he did actually have car trouble? I guess I still don't see the reason he didn't want the ride. I mentioned elsewhere that it was a trip to Miami Beach, like a $50-60 ride. If he truly had car trouble he would not have cared about his place in the queue. He would have had to continuously cancel rides whil dealing with the car problem, since he was at the front of the queue. See, I try to seek for good in people. Now I am picturing my driver feverishly trying to fix his car in the scorching 3PM heat of Miami, as his smartphone continues to buzz with Uber ride requests. I feel horrible now. I also do wonder if he at some point make it to the terminal, because the receipt looks like he did end up showing up. I have no idea when though. The last time I spoke to him on the phone, he still hadn't moved his car and I was half way to my destination. He wanted you to cancel so it did not look bad on him. I am going to bet his rating was already low and so he did not want to cancel plus if you did it you would be charged a fee he could collect. some drivers pull this at airports. They collect cancelation fees all day. I have had drivers pull this on me other places. one guy literally pulled into a parking lot behind where I was and just sat there waiting for me to cancel. I am blind so always text drivers to let them know to look for me but drivers to not understand our app has speech and when they try to hide we know where they are at all times. I waited him out for 20 minutes until he gave up and showed up. Another driver called and asked where i was going and then insisted I cancel. I refused at first but I did have to get home to go to work so I eventually had no choice however Uber heard about it and I got a refund plus the driver who was a 4.3 got a very low rating. I do not understand why drivers and riders put so much energy into stupid scams that if they would do the right thing everyone would be happy and what drivers do not realize is they are the ones pushing that much harder for autonomus cars so the companies do not have to put up with rediculous human behavior. Did you know that if the driver isn't making an effort to come towards you (upon request), you can cancel without being charged the cancellation fee. Sometimes the Uber app even tells you this. Driver with a 4.3 rating?! That's unheard of. Me personally, I hit the tip button more than most. The only time I do not tip is if a driver does something completey wrong or tries to get one over on me. I tip on almost every tip and I know a lot of people do not tip at all which I find unbelievable. Amen, brotha. Just do the right thing. Yeah I was also thinking it was for the cancellation fee. @Kabe has a good point though. It might have been trying to hold his spot on the airport queue. This has happened to me several times. I think they choose what tries they want and cancel . Well folks if you you took your sweet time getting in and for reason your destination is not wanted then YOU cancel . Look up at night and see the stars because drivers will not be enslaved by assholes who think they have the upper hand to MAKE us do something that we don't want too. This has happened to me before too. I told the driver that I refused to cancel and called him out for trying to collect the fee. I DONT CARE if it looks bad on him. If he is the one who is telling me he can't pick me up he SHOULD be the one responsible, not me! Umm. well, maybe his car broke down for real. but he can certainly cancel the pickup. That's what he should have done. There are no cancellation fees for drivers. It just hurts their acceptance rate. Maybe he was afraid of that? By accepting a ride a driver still does not know the destination unless he asks a passenger (which drivers should not be doing) or when the pickup has occurred and driver hits start trip on Uber. Did you get charged a "no show" fee? I assume after all the back-and-forth, it was way after 5 minutes. If the guy showed up at MIA and then cancelled, he could have easily charged you $5.00. No, I didn't get charged a "no show fee" let me go check my receipt. I am starting to get nervous. I iwll post it here if i can figure it out. If the driver never arrived at the designated pickup location, then the trip was never started and the driver wouldn't be entitled to a no-show fee. When you spoke with the driver, did he ask your destination? What is your passenger rating? Have you ridden with him in the past? All can potentially lead to what he did, even if not allowed. I can't remember him asking. Maybe he did. It's overall weird. I was going to Miami Beach, which is like a $50 ride. You guys me worried, so I just checked. It doesn't say cancelled or anything.. It just says, $0.00. Is that weird? Did he actually come to the location and started and ended the ride? No, if they did that, it would have charged you the flagdrop. That is a weird looking ride. Maybe the driver called Uber?